It was lovely to take a blog writing break while on holiday. I did read posts to keep up with my blogging friends. Found a few thrifted treasures this month. 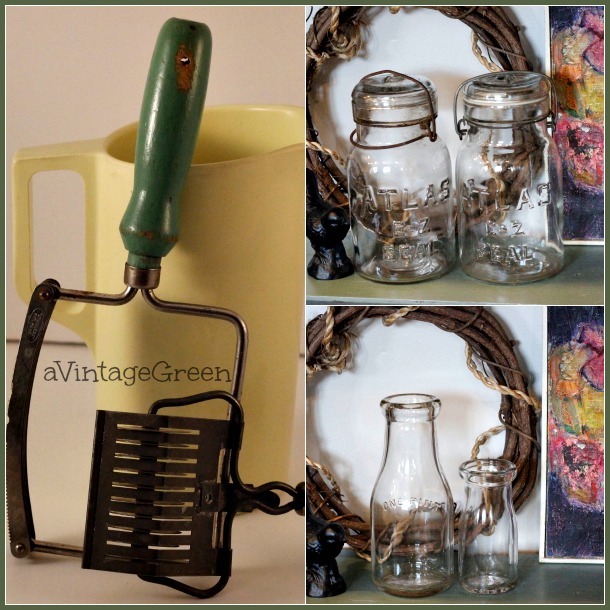 Melmac jug, green handled kitchen tools and vintage bottles. A bit of collector humour. Only painting I did was CeCe Caldwell Simply White on a pair of brown curtain rods and touch ups on an ornate frame. Not photo worthy but the paint helped the rods disappear into the background. When not travelling it was garden watering, clean up, hauling old fence boards to the transfer station, more watering. Visited friends and family, got some small 'in the house' jobs caught up. Hi Joy ... glad you have had a nice holiday. Love the treasures you have found too. Vintage bottler are always good. Your found some great treasures, I love the green handled tool. In to green lately. 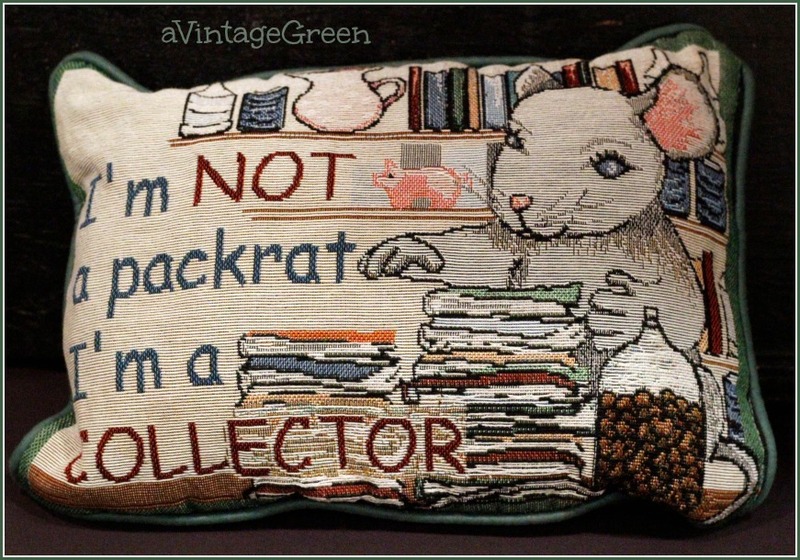 I now know what to say when my hubs calls me a hoarded, no I'm a packrat! Love your finds - especially that pillow. Gave me a good chuckle! Thanks for sharing @ TTF! Great finds! 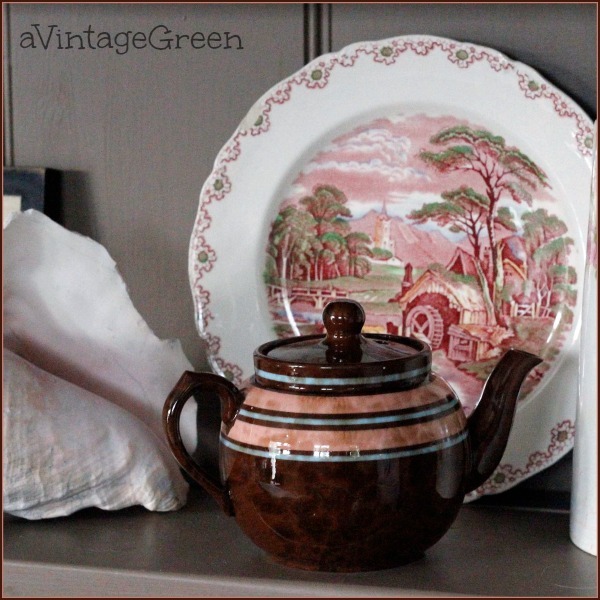 I love the teapot! I will feature this today at HSH! Love your finds and yes I too think the pillow is awesome! I'm a sucker for jars...I use them every day! 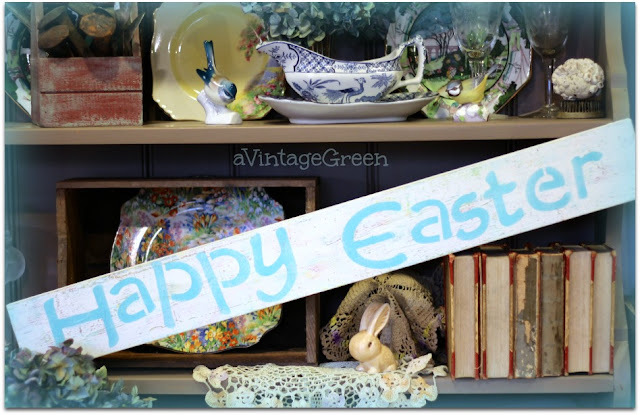 Great finds...thank you for sharing them at Revisionary Life! Joy so glad you had a nice holiday. I think you found some great things.